The popular fizzy drink flavor is hitting store shelves nationwide this month and coming soon to candy aisles near you! And thanks to the makers of Ring Pops I'll be getting to try them out soon and you have a chance to win some too! 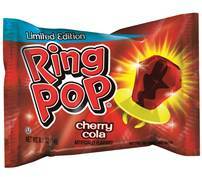 The perennially popular Ring Pop® brand will introduce a mouthwatering new flavor, Cherry Cola, at retail nationwide in September. The tasty, soda-inspired flavor was recently selected by Ring Pop fans through a crowdsource program on Facebook offering devotees of the famed lollipop gem a choice between Cherry Cola, Fruit Punch, and Lemon Lime. Fans were able to vote for their favorite flavor by visiting the Ring Pop Facebook Page. This event, now in its fourth year, marks one of the biggest annual fan events for Bazooka Candy Brands and provides a rare opportunity for candy lovers to weigh in on the iconic, top-selling line. Previous winning flavors of this tongue-tempting flavor face-off include Cherry Limeade, Strawberry Lemonade, and Raspberry Lemonade. Win it: One lucky reader will win a Ring Pops Prize Pack (including the new Cherry Cola flavor). This giveaway will end September 30th at 11:59 PM EST. The winner will have 48 hours to respond to my email. If no response, a new winner will be chosen. Prize fulfillment will be made by the sponsor, I am not responsible for prize delivery or lost or stolen deliveries. Open to residents of the US. We love the cherry ones the best but like other flavors too. I'd like a chocolate one, like Tootsie Roll Pops. I also would love to try the new Cherry Cola flavor! We really like cherry best. Would definitely pick Cherry Cola!!! I would definitely choose watermelon. Yum! I would pick raspberry or watermelon. I would choose pina colada!